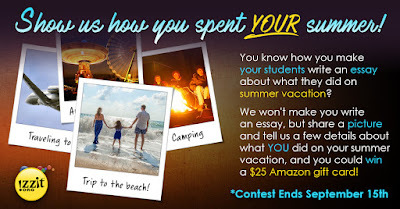 You know how you make your students write an essay about what they did on summer vacation? We won't make you write an essay, but share a picture and tell us a few details about what YOU did on your summer vacation, and you could win a $25 Amazon gift card! Comment on Facebook or Twitter with your photo to be eligible. Contest ends September 15th. For rules click here.